Entrepreneurial success often demands that a business person have a standard operating procedure (SOP). This procedure is the step-by-step instruction of how and what needs to be done to push their idea, invention, product, or app towards sales and cash in the bank. It’s sales that investors want to see. This is an important representation of how. Investors want to see market validation for your entrepreneurial invention. The steps below are a new concept to a beginner in business. This process is like riding a bike to a seasoned veteran. They know the steps to take to achieve the results you want. Being able to hook up, pick their brain and get advice from one of these veterans can turn decades into days. Seek out these idea pros and use their advice to get ahead with your product. Experts of specific niches tend to create initial presentations to show to their database off to consumers. If they have affiliate arrangements with other successful online marketers, they get their lists to attend the event too. It’s from these initial sales that the internet online education experts fund the courses they will develop. You will want to do this for your business to prove the demand for your product using pre-orders or sales. By getting proof of concept and initial sales, you’re essentially financing your production, and that means that you’ve now built in your customer as the investor. Being able to do this will give you the option to say “no” to the investment angels or the venture capitalists. Investors may want more than 50% of your business. This is where a Super Venture Partner™ like IdeaPros can step in. We can take you to the next level instead and try to help you get the return on your investment. How Ready Does Your Product Have To Be To Pre-Sell? If you are launching a product, all you need is a manufacturer in place with an established minimum order quantity (MOQ). If it’s an app, you need a developer in place with an established quote to build and code everything. What’s nice is the process will give you a real feel for the market and how needed your solution is in the marketplace. Often inventors and entrepreneurs want an idea pro or a Super Venture Partner™ to partner up with, a company with people who’ve been there and done that. Get Quotes/Estimates from manufacturers to know per unit cost and minimum run required. Being prepared is always wiser versus jumping in and hoping for the best outcome. Establish a Minimum Viable Goal (MVG). Knowing the minimum amount of units you need to sell to begin production is crucial. You need to know how many items to pre-sell to cover your initial costs, and that includes paying yourself! Consider putting together a pre-order chapter in your policies and procedure manual. What steps will you take to confirm orders? What emails will you send your loyal initial investors? How many follow up and updates will you provide? Will it take to get the shipment of the initial product to your customer’s doors? How will feedback be handled? What process will you use for refunds? How will you receive testimonials? These are some of the points you want to consider in your pre-order chapter that goes into your policies and procedures manual. After you’ve gone through this with your ideal partner, you’ll know your marketing budget for the first run. This is what an investor wants to see to take you entrepreneurial invention seriously. 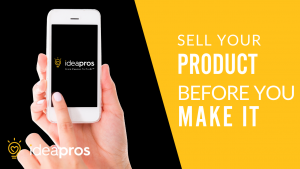 IdeaPros has the resources, experience, and tools to help you succeed at this step or any step in the entrepreneurial journey. We partner with entrepreneurs at any stage and those who are ready to invest in the success of their idea. Apply for an interview to explore the idea of partnering together.